CARLTON’S hopes of keeping a grip on the Citylets Scottish Cup were dashed as they were swept aside by Ferguslie. The win completed a remarkable weekend for Michael English, who smashed a brilliant century for the Paisley outfit - 24 hours after reaching three figures during the Western Union tussle with Clydesdale. English was run out for 120 - propelling Ferguslie to 246 at Meikleriggs. Carlton’s reply began in disastrous style as they lost their first two wickets with only four on the board. Feegie continued to make breakthroughs at regular intervals, preventing the visitors from forming any meaningful partnerships. And they were shot out for just 205. Ferguslie will now square up to Grange in the semi final at Raeburn Place after the Eastern Premiership pacesetters defeated local rivals RHC Lions at the same venue. RHC were dismissed for 216 for nine, featuring a stand of 112 between Hasan Azam (93) and Majid Haq (58). Then Ryan Flannigan snatched the limelight to stave off any surprises. Flannigan thumped an unbeaten 119 - the day after he had made a double century for the second eleven. His stay at the crease lasted 139 balls and he found the boundary 16 times to guide Grange home. Skipper Preston Mommsen also weighed in with 61. The other semi final will be fought out by Heriot’s and Arbroath at Goldenacre. Arbroath were too strong on home turf for Uddingston after pro Shanuka Vithanawasam struck a fine 88. Calvin Burnett (54) was also in form as they surged to 244 for nine. The giant-killing quest of Weir’s came unstuck at Goldenacre, where Eastern Premier champions Heriot’s cruised to a nine-wicket win. 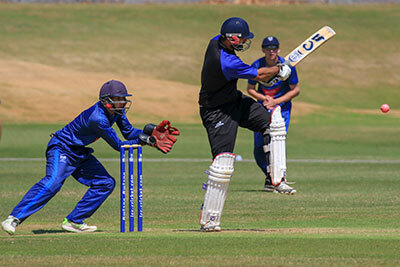 The Glasgow side acquitted themselves well with the bat, posting a total of 200 for eight. But the target proved to be a formality for the hosts as they passed it with ease.